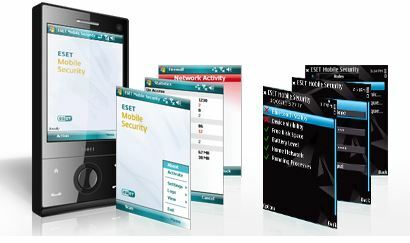 ESET Mobile Security delivers comprehensive protection for your Android, Windows Mobile and Symbian smart phone by defending against the latest multiform threats and to keep your personal information safe. Smartphones, PocketPCs and Tablets are widely used for communication, entertainment and services. As tiny computers, these mobile devices are becoming more standardized and packed with more sophisticated features. They also are increasingly at risk of attacks and exploits. The new ESET Mobile Security has low CPU, memory requirements and compact updates which minimize data bandwidth usage. It will protect email attachments and other files being transferred or accessed without impacting performance and will keep your mobile phone safe – even between signature updates. Its fast engine keeps your inbox uncluttered by filtering SMS/MMS spam from unknown and unwanted senders. Not looking for mobile security for your phone? Click here for information on ESET security products for desktops and laptops. Fast signature scanner finds and cleans known threats before they can cause damage. Heuristics engine protects against unknown threats between signature updates. Scan memory and running processes, onboard files and removable media for malware. Search deeply into nested folders to uncover malicious software. Scans all accessed files for viruses, including email attachments and files accessed via wireless means such as Bluetooth, WiFi, infrared etc. Safely insolates infected files and gives the experienced user the option to review, restore or delete them as appropriate. Block messages from unknown senders or use black and whitelists to filter your messages. Provides an at-a-glance summary of On-Access scanning, SMS filtering and quarantine activities. Scan statistics are stored in a user-friendly format. Up to 50 logs can be stored on board. Delete all the data (including contacts and messages) on your phone with a single SMS, preventing it from falling into the wrong hands. The same text message can also delete any data stored on memory cards inserted in the device. Create a list of trusted SIM cards for the device. In case of an unauthorized SIM card insertion, you are automatically notified by a text message containing the IMEI and telephone number, so you can locate the perpetrators. Run in-depth on-demand and scheduled checks of all vital phone functionality such as battery level, Bluetooth connectivity, device visibility, free disk space, and running processes, then take immediate action if required.